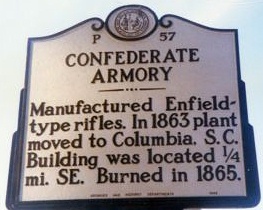 The Confederate Armory, Asheville, North Carolina: It manufactured Enfield-type rifles, and in 1863 the plant was moved to Columbia, S.C.
With the outbreak of the Civil War the production of firearms extended to the mountain region of North Carolina. In Asheville, a company owned by Col. Ephraim Clayton, Col. R. W. Pulliam, and Dr. G. W. Whitson manufactured Enfield-style rifles. Their factory stood on the corner of Valley and Eagle Streets. Their first products, however, were rejected as inferior by the Confederate government, which took over the facility in the fall of 1862. Maj. Benjamin Sloan (a graduate of the U.S. Military Academy at West Point), formerly an inspector of ordnance manufactured by the Tredegar Ironworks in Richmond, was sent to Asheville to take charge of the armory, which soon began to generate superior weapons. Late in the war the plant equipment was moved to Columbia, South Carolina, and operated until the Union army of Gen. William T. Sherman captured that city in February 1865. The armory building itself was destroyed in 1865 when Federal troops finally entered Asheville during Stoneman's Cavalry Raid. After the war, Benjamin Sloan became a professor of mathematics and physics (in his native state) at the University of South Carolina. References: George W. McCoy, “Confederate Armory Here Turned Out Superior Weapons,” Asheville Citizen-Times, January 13, 1952: F. A. Sondley, A History of Buncombe County, North Carolina (1930). Drawing upon the observations and reflections of the soldiers themselves, Hess offers the most compelling argument yet made regarding the actual use of the rifle musket and its influence on Civil War combat. Engagingly written and meticulously researched, his book will be of special interest to Civil War scholars, buffs, reenactors, and gun enthusiasts alike. Recommended Reading: Civil War Firearms: Their Historical Background and Tactical Use. Description: The popular Civil War News columnist has written a unique work, combining technical data on each Civil War firearm, an often surprising treatment of their actual use on the battlefield, and a guide to collecting and firing surviving relics and modern reproductions. About the Author: Joseph G. Bilby is a popular columnist for the Civil War News and a veteran of the current 69th Regiment. Recommended Reading: The Civil War in North Carolina. Description: Numerous battles and skirmishes were fought in North Carolina during the Civil War, and the campaigns and battles themselves were crucial in the grand strategy of the conflict and involved some of the most famous generals of the war. John Barrett presents the complete story of military engagements across the state, including the classical pitched battle of Bentonville--involving Generals Johnston and Sherman--the siege of Fort Fisher, the amphibious campaigns on the coast, and cavalry sweeps such as General Stoneman's Raid. Also available in hardcover: The Civil War in North Carolina .